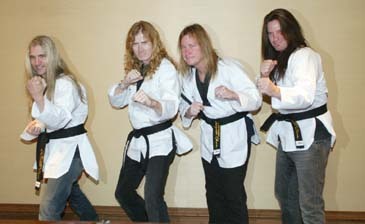 Members of the legendary U.S. thrash band in taekwondo uniform are in taekwondo motion, shortly afrter Megadeth leader Dave Mustaine (second from left) received a certificate of appointment as the WTF's Goodwill Ambassador in a ceremony at a Seoul hotel on Oct. 27, 2007. U.S. "legendary" thrash metal band Megadeth leader Dave Mustaine says that his life has changed for the better mainly thanks to taekwondo. "Taekwondo is a great discipline. For me, it was one of the things that changed my life," Mustaine said in a recent interview. "It (taekwondo) helped me to eliminate a bad lifestyle of drug and alcoholism. It helped me to believe inside of myself and find the strength inside of myself that I never knew that I possessed." Mustaine made the remarks at the Grand InterContinental Hotel in Seoul on Oct. 27, 2007, shortly after he received a certificate of appointment as the WTF's Goodwill Ambassador of the World in a ceremony. Mustaine and three other Megadeth band members – bassist James LoMenzo, guitarist Glen Drover and his brother Shawn Drover - arrived in Seoul on Oct. 27 for their concert at the Olympic Hall of Olympic Park in Seoul on Oct. 28. For Megadeth, it was their fourth concert for Korean fans. "For me, it is a big responsibility and I am going to represent the WTF the best I can," Mustaine said of his appointment as the WTF's Goodwill Ambassador. "I am really excited to be the WTF Goodwill Ambassador." Mustaine said that taekwondo is "the source of his confidence in his life." He is a 1st Dan black-belt holder. He said, "I know that there are a lot of young people around the world that look up to me and I think this is a great discipline." Mustaine said he started training taekwondo in 1999 in Arizona and then moved to California, where he now lives. "Before taking up taekwondo, I practiced kungfu and other martial arts." As a pioneer of the American thrash metal movement, Megadeth rose to international fame in the mid 1980s, but was plagued by constant lineup changes, partly due to Mustaine's and fellow band members' notorious substance abuse problems. After finding sobriety and securing a stable lineup, Megadeth went on to release a string of platinum and gold albums between 1986 and 1997. Megadeth disbanded in 2002 after Mustaine suffered a severe nerve injury to his left arm. After 17 months of extensive physical therapy and intensive taekwondo training, Mustaine reorganized the band in 2004.